I originally started this blog to recount some of the more bizarre and funny things that happen to me on a daily basis, or at least exaggerate otherwise simple and uneventful occurrences so they seem bizarre and funny but lately the posts have been a bit more serious and reflective. I feel like I should be sitting by a window while it's raining, Yanni softly playing in the background and flickering light from my last candlestick shooting streams of fiery light up the walls while I contemplate the things of life each time I write or read this blog lately. A bit weepy and sometimes drenched in melancholy lately for those who have followed this blog for a little while and know that until recently it was anything but melancholic. I certainly didn't intend for that to happen and so as I prepared to blog tonight I tried to think of something funny and crazy to write about. It's not as though I've run out of things to poke fun at or experiences to laugh about. I could write about my trip to the store recently with Krishelle when we ended up spending 15 minutes in the eyeglasses trying on every pair wishing that we needed glasses because we found so many that we liked. I could then tell you about how she called me several days later and said she went to an eye appointment "and I have really bad news. My eyes are perfect." I could write about how disappointed I was to hear that and then how hard I laughed after and still laugh about even now because of how ridiculous it is that we would want a part of our body to fail for fashion. But I have no quota to fill and no rules to follow in this blog--no, fortunately this is one piece of life that has no high expectations imposed and no boundaries set. My friends and I constantly joke about name-dropping but I think I'll step into that sin a little bit tonight because this week I've had some interesting experiences with people whose names are worthy to "drop." I attended a sealing in the Salt Lake temple on Friday and while waiting in the sealing room for the ceremony to begin, Quinn leaned over to me and said, "that's Elder Scott in the hall!" I leaned over to see and then told Quinn that he was mistaken and that that man didn't look a thing like Elder Scott. But Quinn insisted that it was him and I forcefully disagreed for several minutes until the man entered the room and began speaking at which point in became very clear that I apparently am not very good at recognizing members of the Quorum of the 12 because this actually was Elder Scott. It was a small sealing- only 15 or 20 people- most definitely the most intimate setting I've ever had with an apostle. And it was one of the most amazing experiences I've ever had. The best word I can think of to describe the whole ordeal is "captivating." The entire experience was completely captivating as we listened to Elder Scott give tender counsel and very powerfully yet humbly pronounce those amazing eternal blessings with such authority. I had definitely been spoiled enough with that temple experience but I was fortunate enough to have another just two days later. Elder Perry came to our stake conference today. He actually showed up part-way through our priesthood leadership meeting this morning and told us all to "sit down and listen!" with his quaint and vibrant humor after we stood up out of respect when he entered the room. I thought I had been asked to say the opening prayer in that meeting but thought I must have done something wrong when someone else was called up to pray. 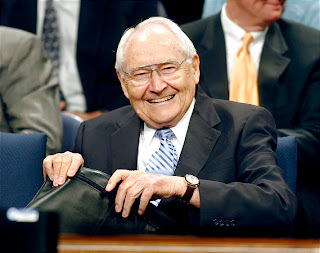 It turned out that I was scheduled to pray in the general meeting just a few hours later which worked out well for me because I got to sit up on the stand just behind Elder Perry the whole time. I don't mean to sound like a dumb-struck fan begging stars for photos and autographs. I wouldn't be nearly as excited to be in the vicinity of any movie star, politician or celebrity of any kind. That's because the respect I have for these people far outreaches the respect I have for anyone outside the realm of my closest friends, family members and other priesthood leaders. I suppose that that's because the work they do and the example they set far outreaches even the most well-meaning humanitarian work of the most sweet-hearted celebrities outside of the church. I believe that has something to do with their intentions; these men know the meaning of selfless service better than any and they live that selfless service, sacrificing all of their time well into their old age when for most people it becomes physically difficult to continue doing the kind of work that these men and their wives do daily and well into the night. And I am so grateful that every once in a while I get to have a unique glimpse of these people as little reminders of the kind of good this world can contain. I agree that nothing can compare to the warm spirit and sincere love that emanates from the people who are guiding the Lord's work. Shaking the hands of the former stake presidency today held just as much meaning for me because of all of the love and sacrifices that they have offered to us. Anyway... just wanted to say thanks for the inspiring messages in your recent blogs, even if they are "melancholy". Wow, sounds like you had quite the uplifting weekend. That's awesome. Eli, I love your posts, no matter what your topic. I'm so happy that you've been bloggin more lately, too. Those are some pretty cool experiences. Thanks for sharing them with us. How amazing! We are so lucky to have such wonderful people leading our church! I should shake your hand. 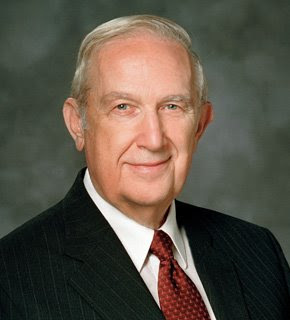 Then i would have shaken the hand of someone who shook hands with Elder Perry who shook hands with President Hinckley who shook hands with President Joseph F Smith who shook hands with the Prophet Joseph Smith. Whoa.